MicroCare's new Fiber Care FiberWipes™ are specifically designed for use by technicians working on fiber optic and/or photonics applications. These wipes are made of a glue-free, super-purity, lint-free polyester material that is stronger, softer and more absorbent than traditional "cellulose wipes." These wipes are sized perfectly for cleaning fibers either (a) after stripping prior to termination or fusion splicing or (b) for cleaning connector end-faces after polishing. The convenient mini-tub makes these wipes a winning choice on the workbench or out in the field. 90 wipes/tub. This unique product contains a high-purity solvent engineered for cleaning precision optical components made of glass, metal, or soft plastics (including plastic optical fiber). This formula neutralizes static electricity to dissipate bonds that attract and hold particles to surfaces. It also dissolves fingerprints, light oils and surface films. Fast-drying and ozone-safe, this should be considered a nonflammable replacement to isopropyl alcohol and acetone. Safe on most materials glass, ceramic, metal, plastic, electronics and cured epoxy surfaces. Test before use on lens coatings. Easy to use and ultra-pure. The Fiber Prep Fluid from MicroCare leads the industry for cleaning fiber before splicing. Unlike competitive solvents, this optical-grade fluid has been engineered specifically for cleaning glass fiber prior to fusion splicing or termination. Nonflammable and plastic-safe, it also is ideal for cleaning residues from connector end-face after polishing. The cleaner is a safe, fast-drying, ozone-safe replacement for alcohol cleaners. 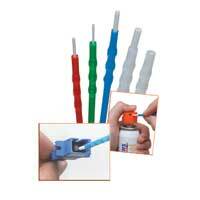 It easily removes the buffers, dust, oil, grime and moisture from fiber optic cable. For this product, the packaging is as important as the solvent. This product uses the unique, Triton™ 3-way dispensing valve. The Triton dispenser allows users to dampen a cleaning swab, wet a wipe, or spray the solvent all from the same package. The package is TravelSAFE™ so these pump sprays can be shipped, even by air, as non-hazardous materials which saves money. Ultra pure, this cleaner dries quickly without residues. 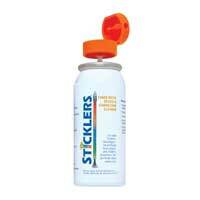 This unique mini-pump spray dispenser contains 400 squirts of a nonflammable, plastic-safe, optical-grade cleaning fluid formulated for cleaning fiber optic ferrules installed in connector bulkheads. Fast-drying and ozone-safe, this non-hazardous cleaner is ideal for cleaning dust, oil, grime, and moisture from fiber optic ferrule ends and connector bulkheads. 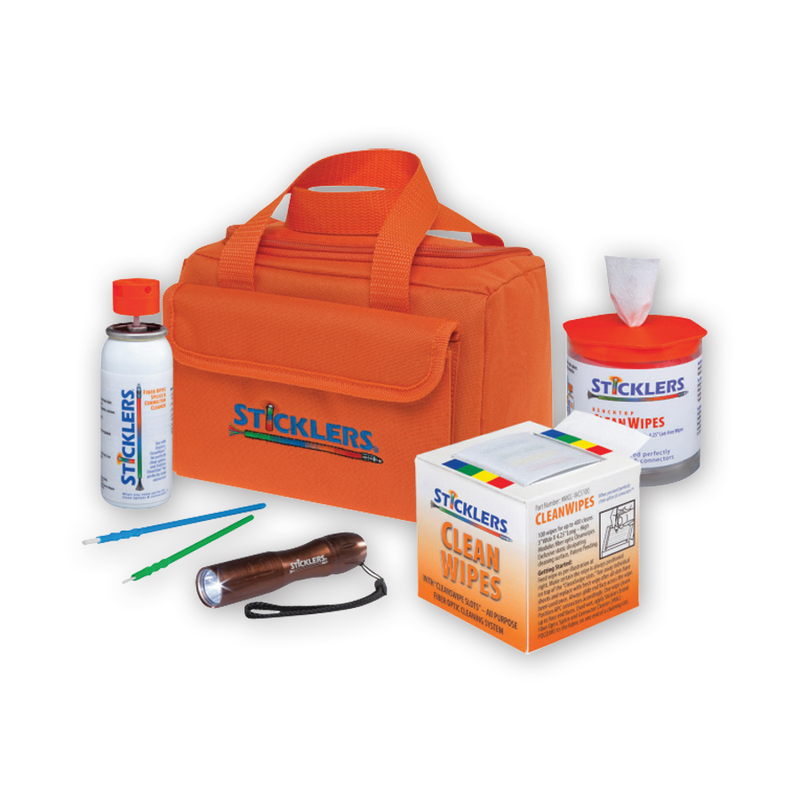 It is safe to use on most materials, including glass, ceramic, metal, plastic and cured epoxy surfaces. Ultra pure, this cleaner dries quickly without leaving a residue. The hermetically-sealed mini-pump spray uses the unique Triton™ 3-way dispensing system, the most versatile packaging system in the industry. The sealed canister also prevents refilling and cross-contamination, ensuring clean solvent every time. The canister also is “TravelSAFE™” — that is, the pump spray is “nonhazardous, non-regulated” so it can be shipped, even by air, without extra paperwork or hazmat fees. Engineered specifically for cleaning fiber optic connector end-faces and/or optical fiber before splicing, each FiberAide™ wipe is made from MicroCare’s field-proven lint-free fabric that resists linting and tearing, even on LC connector end-faces. FiberAide wipes most often are used during the installation, maintenance and repair of fiber networks in harsh environments. Each lint-free wipe is in a contamination-proof packet that is opened just before use, so cleaning is fast, efficient and cost-effective. This product is simple, reliable and easy-to-use, even for infrequent users. The wipe itself contains no cellulose, glues or bleaches which might contaminate surfaces. The foil package protects user’s hands from any solvents, eliminating the need for gloves or finger cots. Each wipe can clean up to six connector end-faces. Engineered specifically for removing microscopic particulate and oils from optical devices, the FiberCare family of optical cleaners deliver excellent value and performance. These products can be used on any optical device, photonics system or component.